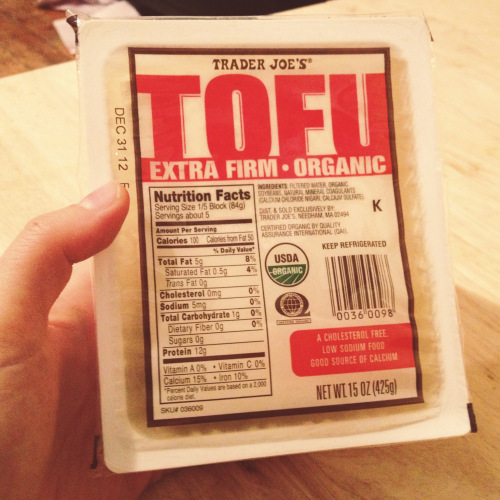 The first time I made tofu, dinner was a disaster. It was inedible. 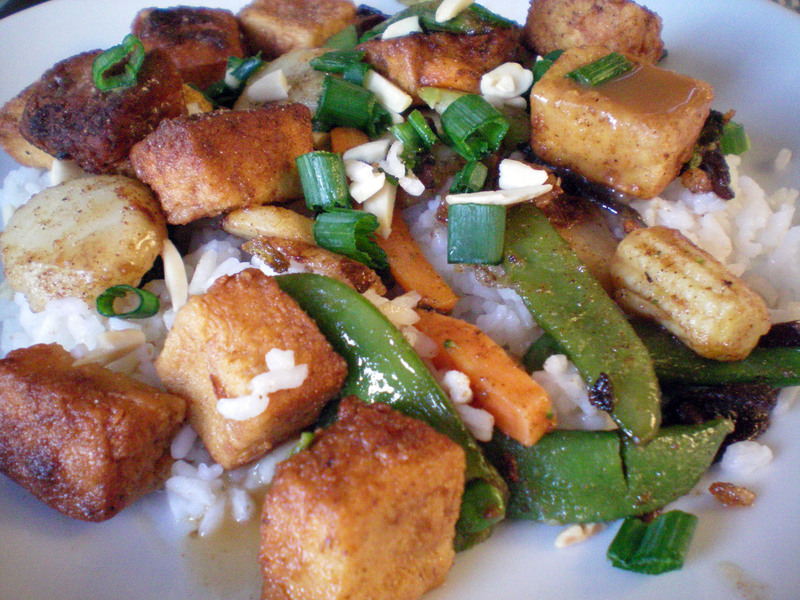 Years later, the following dish became my go-to tofu dinner. 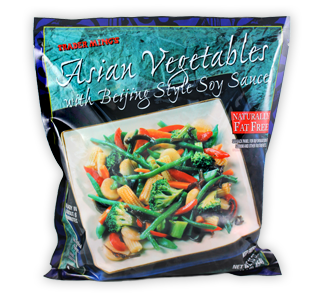 A *warning* here is that the sauce in the Stir Fry pack is not gluten free! Why do I buy it then? Because I like the array of veggies and the amount is just right. Also, the sauce is super delicious, a favorite of my boyfriend’s, so if you have someone in the house who is not GF, then they can be happy, too! Start the process by draining the tofu, this is an important step: On a medium sized plate (that I’ll use later), I place a folded paper towel, with the drained tofu on top. 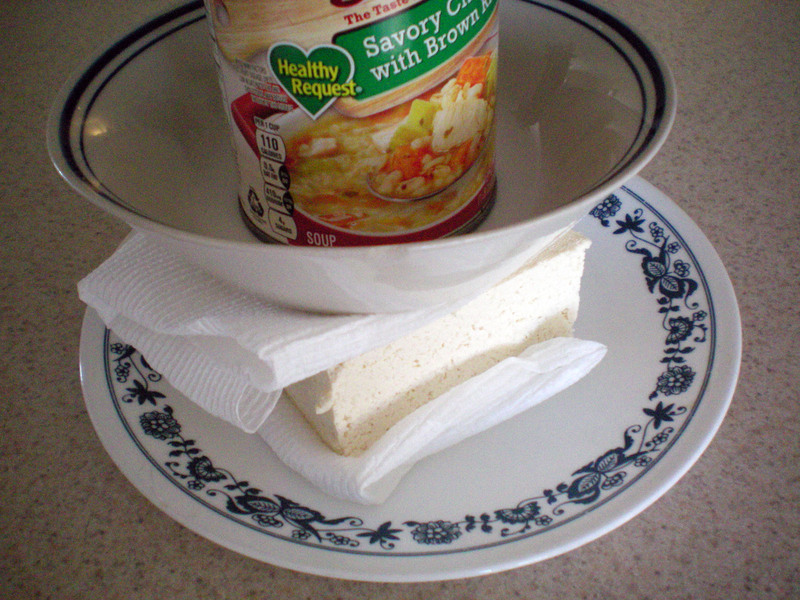 Place another folded paper towel atop the tofu, and top that with a bowl (that you will use later), with a heavy object, like a soup can, inside the bowl. Change the paper towels, as needed, to allow the tofu to drain for at least 20 minutes. While the tofu is draining, mince the garlic and chop the green onion. You can also measure the flour into a bowl and add some shakes of salt and pepper. Once the tofu is much drier, it’s time to get the veggies ready. In a large pan, cook the veggies as directed on the bag: heat the Tbsp. of oil, add garlic and cook veggies over high heat for about six minutes, stirring frequently. 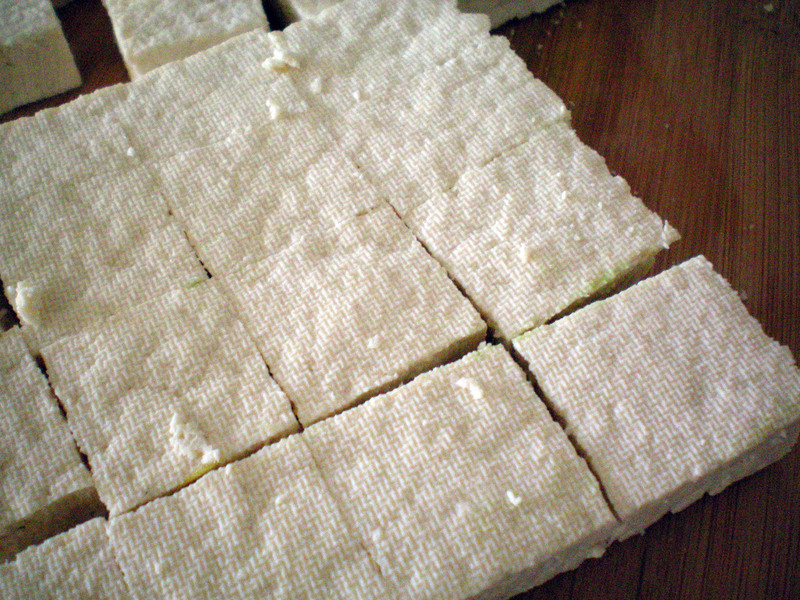 While the veggies are cooking, slice the tofu into bite sized pieces: Often, I will slice off a 1/4 in. piece from the short end, to use for a grilled tofu sandwich. Place this spare piece in a ziploc bag with a little bit of water. 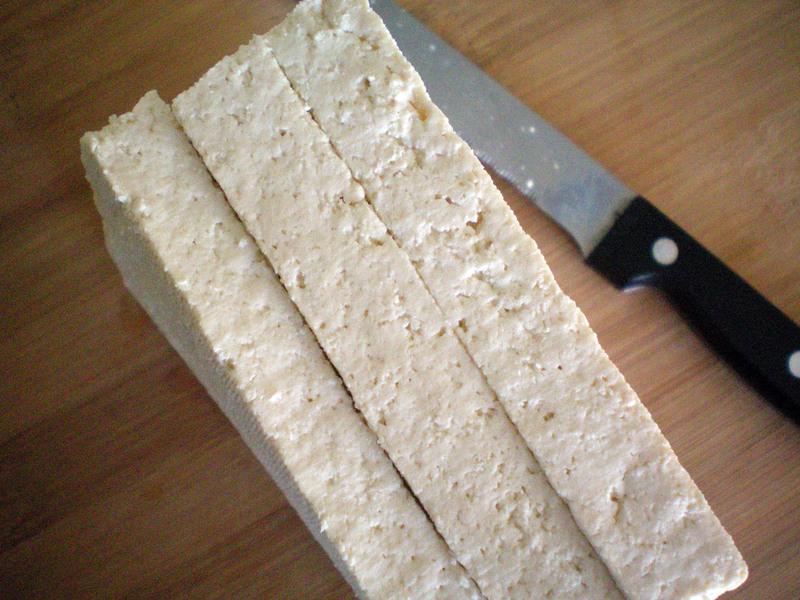 Slice the remaining tofu into three sheets. Re-stack the three sheets and cut the sheets into 16 parts; three cuts one way, three cuts the next. Don’t forget to stir the veggies! Take the bowl off of the tofu, and crack and beat the egg in that bowl. Once the veggies are done, you can place them on a large plate. Set the large pan aside, as you will be using it for the tofu. Once it has cooled a little you can place the pan back on the stove and add enough peanut oil to coat the bottom, about an eighth of an inch. Turn the heat up to medium high heat. 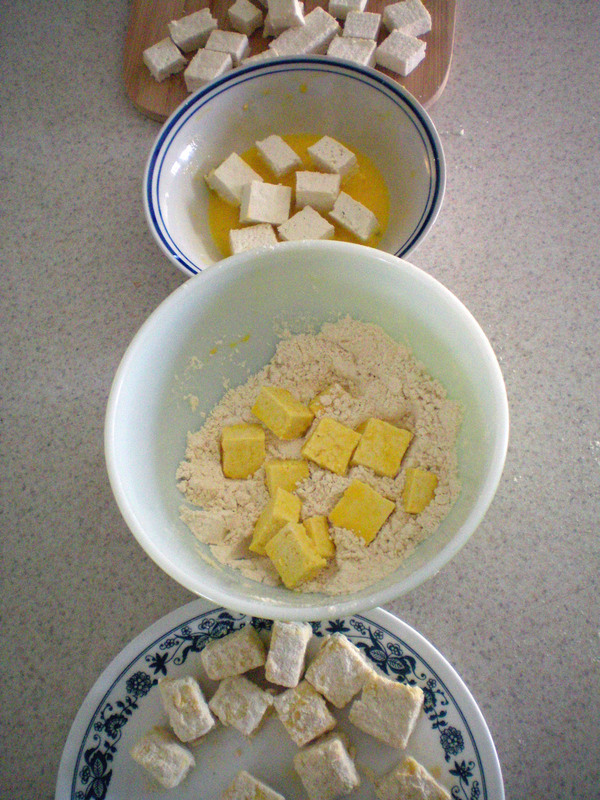 Make an assembly line: tofu, egg, bowl of flour and then the plate the tofu was draining on. Take a small handful of tofu and coat them in the egg, drip them off a little before you toss them around in the flour. Place the covered pieces of tofu on the plate. You may need to clean off your hands from time to time. 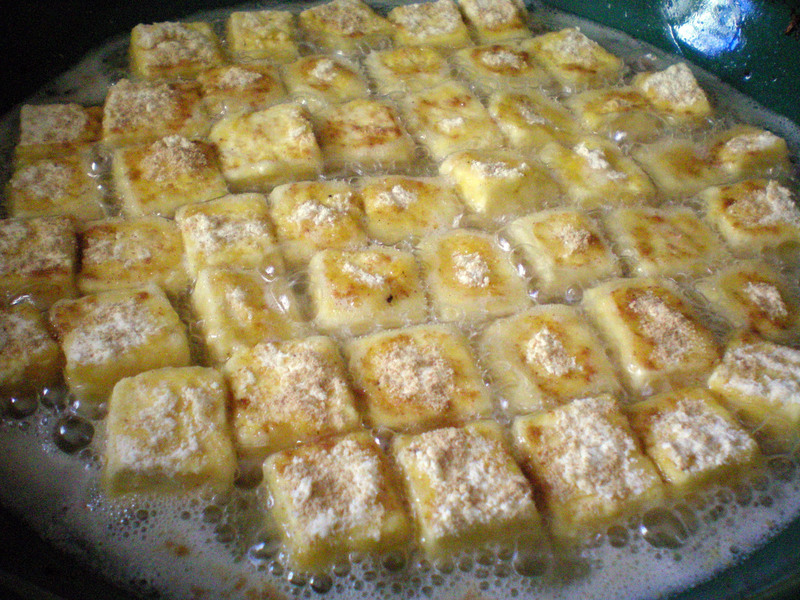 Once the oil is nice and hot, individually place each piece of tofu into the oil. Sprinkle all of the pieces with the ginger and garlic powders. Cook until the first pieces become tanned and crispy looking. Individually flip each tofu with a set of tongs. If you are making instant rice, this is a good time to get it ready. Also, start to prepare the GF soy sauce: Pour the GF broth or water into a small pot. Over low heat, add the cornstarch and soy sauce, stirring occasionally. Stir in the ginger and garlic powders before serving. 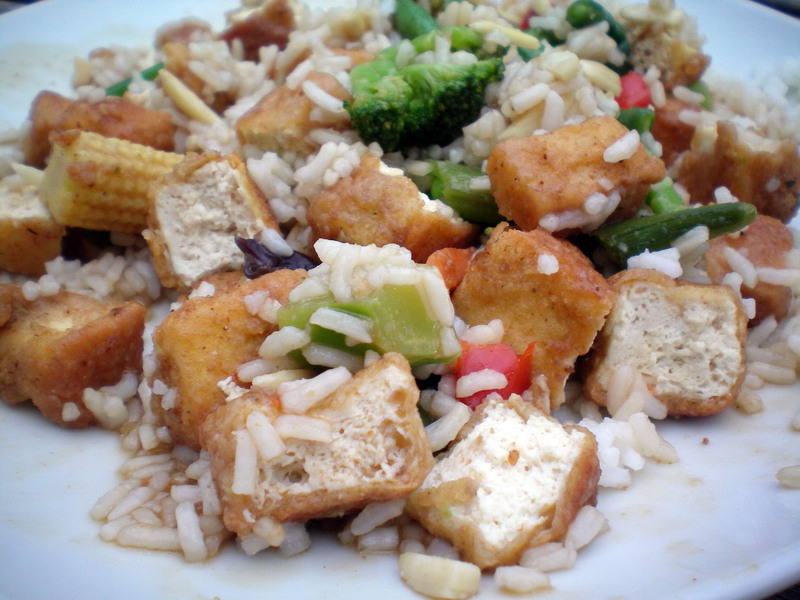 If you want to turn the tofu pieces on their sides to cook, you can, but it is not necessary. 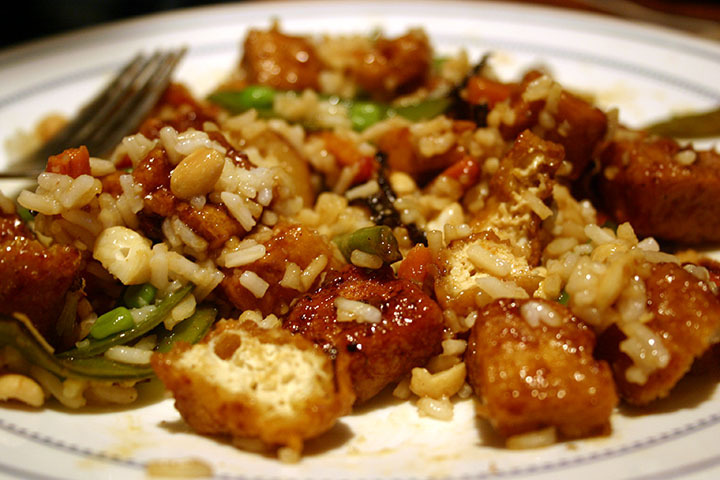 Once the tofu is cooked to your liking, carefully pour out the excess oil. Add the pan back to the stove and turn down the temperature to medium heat. Stir in the vegetables to reheat. Place the large plate you used to the side. At this point, I put a serving of rice each on our two plates. I divvy up the tofu and vegetables evenly, putting one serving on my plate and another serving for my leftovers on the veggie plate. For my boyfriend’s serving, I added the yummy Trader Joe’s soy sauce pack from the veggie bag to his servings in the pan. Stir the sauce in well. I serve one serving of his, on top of his rice and sprinkle the dish with green onions and slivered almonds. For my dish, I pour some of the homemade sauce and mix it into my stir fry and rice. Top with green onions and slivered almonds and enjoy! For our leftovers, I save our portions in separate containers, with the rice on the bottom and stir fry on top. Forgive me, as I am new to making my own sauce. Check out these four recipes from allrecipes.com. Combine all in a 1-cup measuring cup.